Click to make them HUGER! Even though the asteroid is small and the asteroid particles are tiny, there are still some cool orders-of-magnitude involved in humans' study of these objects. Check it out. Holy crapola! Relative to bottom image, the middle is a ~100x zoom, the bottom is a 100,000x zoom. Aside from that coolness, this is cool because it is the first time humans have collected material from an asteroid. First time, ever! The last time something similar was done was during the Apollo program four decades ago! About time! Why go through all this trouble for these tiny asteroid particles, you ask? 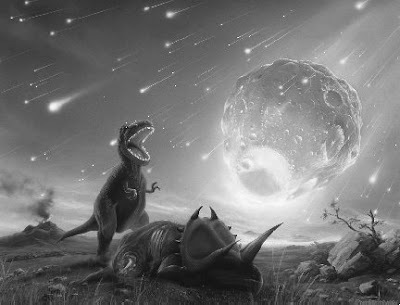 Well for one thing the more we know about asteroids, the more well-equipped we are to avoid a getting hit by one and in the process becoming extremely dead (as a species). This may seem far-fetched, but we're pretty sure it has happened before, and there is no reason it can't happen again. T-rex, really pissed off about his imminent demise. Triceratops, resigned to his/her fate (or maybe already dead from the T-rex). An image of the chicxulub crater, thought to have been caused by the asteroid that brought about the demise of the dinosaurs. This is not a visible image, but an image of the gravity distortions caused by the asteroid impact. 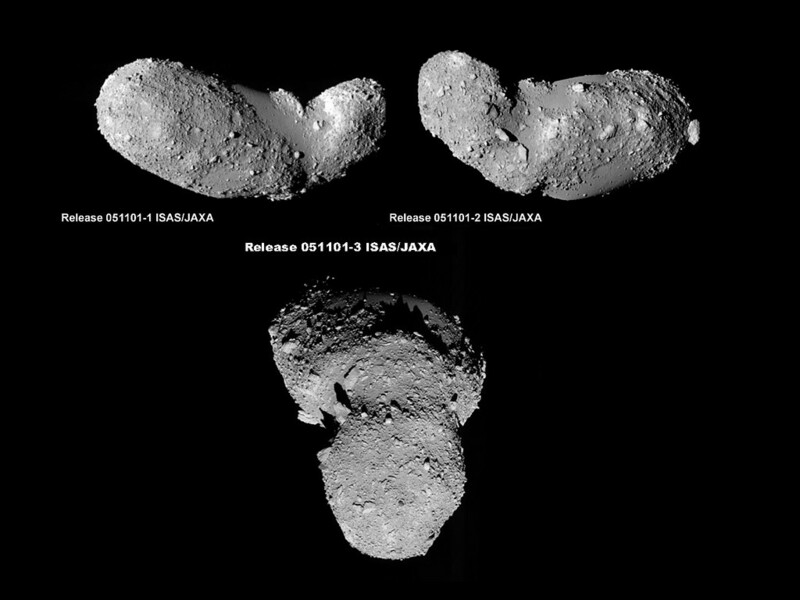 By measuring the density of Itokawa, this Japanese mission showed us that this asteroid is more of a rubble pile than a solid object. If you were trying to deflect a 600 meter-long rubble pile or a 600 meter-long solid mass from hitting earth, you would probably use slightly different tactics. Now we know with more certainty what these types of asteroids are and can start planning! Aside from saving earth, here's what gets me psyched about the mission to study Itokawa. Most of the objects in the asteroid belt are leftovers from the very beginning of the solar system. They have never reached sizes large enough to cause them to melt and allow their heavier elements to sink to their cores, as happened with earth and the other planets. These asteroids really are the leftovers of the cosmic soup from which the solar system was born. How cool that this stuff is still around and that humans went and brought some back to earth! For more on what scientists are learning from these asteroid particles, go here and here. Here's what gets me MEGA psyched: Space particles -- brought back to earth so we earth particles (aka humans) can use our eye/brain particles (aka eyes) to learn more about the nature of our solar system and how we got here! Earth particles investigating space particles in order to better understand themselves! And there are pictures!!! I'll leave you with this video of the Japanese Hayabusa probe bringing these asteroid particles back to earth. 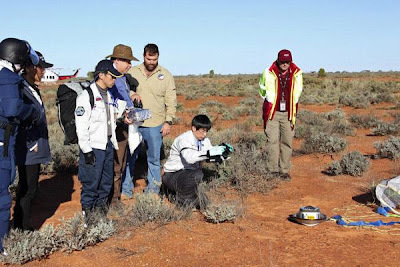 You will see the probe slamming into our atmosphere, whereupon most of the spacecraft was vaporized, leaving the heat-shielded capsule (which is hard to see since its not burning up) to land safely in the australian outback. Also here's a photo of the scientists documenting their recovery of the capsule. That capsule was on an asteroid!! !